For Strings - bass book. Composed by Larry Clark. Arranged by Larry Clark and Doris Gazda. Book. With Standard notation. 32 pages. Carl Fischer #BF00053. Published by Carl Fischer (CF.BF53). 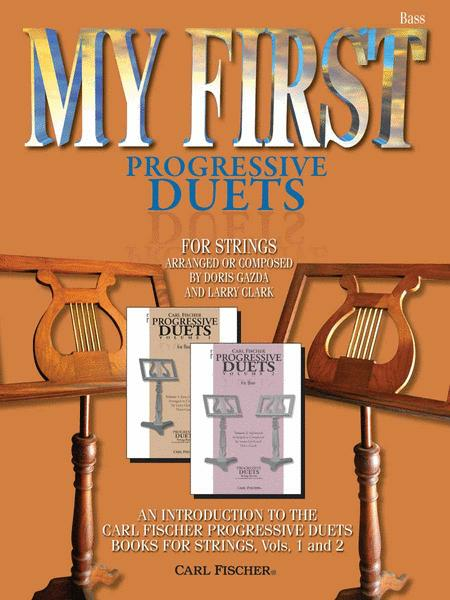 My First Progressive Duets for Strings combines two of Carl Fischer Music's most successful and effective series, introducing beginning players to the teaching method of Progressive Duets for Strings, while remaining appropriate for their skill level. 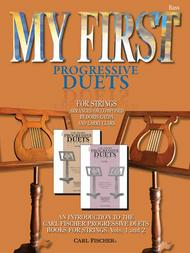 My First Progressive Duets for Strings are compatible for all stringed instruments and can be played with any combination of two. Each collection starts with beginning-level pieces and gradually progresses to the level of Progressive Duets for Strings, Vol. 1, building ensemble skills at a very early level. Now teachers can introduce their beginner students to this invaluable series right away! For beginning players.